Would you believe that once upon a time a saw mill was located on the corner of Wyandotte and Walker? Is it possible to imagine that Walkerville was once densely forested? This is no fairy tale! The mill did exist and was owned by the Walker family and operated before the turn of the century, turning local logs into lumber for export and for use in many local Walkerville homes. To power the mill, a Goldie Corliss steam engine was purchased from the Goldie McCullough Co. of Galt, Ontario for the enormous sum of $1,000 in March 1885. It was installed by Walkerville-based Kerr Brothers and was the heart of the mill for seventy years. 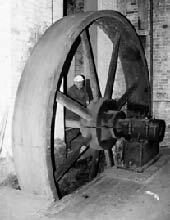 The steam engine was an immense machine with a 12 foot flywheel. The engine component was twenty feet long and four feet in diameter. The bolts holding the flywheel together weighed approximately twenty five pounds each! The engine powered the machinery that produced rough and dressed lumber, crating, interior trim casings, baseboards, wooden boxes, doors, windows, cabinets and staircases. One of the last people responsible for maintaining and operating this gigantic engine was George Nurbury who came to Walkerville by way of Salford, England. His pay in 1947 was 89 cents an hour. Jim Cooper, owner of the mill from 1947 to 1976 describes the workings of the engine: "The routing of the day was George pulling the line in the boiler room, it was, I believe 7:30 or 8 am, which in turn blew the steam whistle atop the boiler room, calling all to work. He then crossed the alley-way to the room which housed the steam engine on the west end of the mill and at the time (in what sequence I cannot recall) and with two hands, turned a large valve which opened the steam line from the adjacent boiler room." "I believe, at this point, he made some other adjustments, which only those in the field would know, and then very slowly, the large piston would make the first horizontal stroke and this was the most exciting thing to watch. Gradually, the strokes grew faster and the hand rail surrounding the engine gave you a feeling of safety as it moved to its maximum speed, turning the 12 foot flywheel, which carried and delivered the very wide leather belt to the line shaft to the half-earthen basement below. Immediately, the main line shaft was delivering its power to the many sub-lines and connecting belts to the main floor and progressively to the second floor. All in all, with the whirling pulleys and flat belts of all sizes, and lengths, from line shaft to pulleys, the Walkerville Lumber Mill was alive and able to manufacture the wooden products of that day." Some years later, the boiler was converted to low pressure and a 200-horse motor was installed in the basement. From then on, the mighty steam engine lay at rest. In 1996, the mill was slated for demolition. Fortunately, the owner of the property contacted the Essex County Steam & Gas Engine Club to donate the engine. They gladly accepted and organized volunteers to help with the dismantling. The building was torn down by Mark Gagnon of McGregor and he donated his time and help with his big crane to get this heavy piece of equipment out of the building and loaded on to a flatbed trailer. It was taken to the Zack farm where it is being stored until funds are raised for refurbishing it. The club has applied for a Millenium Grant to help finance their work but require additional funds. They estimate they will need almost $50,000 and expect that it will take about a year for the club members to accomplish the job. If anyone would like to see the engine in its present condition, contact Gerry Vincent at 733-6684. The Club invites everyone to their 15th Annual Steam & Gas Engine Show from August 6-8 in Co-An Park in McGregor. Donations to the club for the steam engine restoration are welcome!